Which Type of Security Guard is Best for You? Armed Security or Unarmed Security? Is there a specific threat to your property / facility? What are the main concerns you have for your property / facility? What is the perception you are trying to attain with having security? Unarmed Security or Armed Security? So, let’s go through each of these questions to help you determine if an armed security guard or an unarmed securty guard would best benefit your property and safety in California. Unfortunately in today’s crazy world, with terrorism on the rise, you need to determine whether your property is a hard target or soft target. A hard target is a facility or property that is guarded or has considerable security measures in place. This would make it difficult for a terrorist to carry out an attack without being intercepted. A soft target is a facility or property that has little or no security protection. It is vulnerable and would be relatively easy for a terrorist to conduct an attack. After determining whether your facility is a soft or hard target you need to understand that terrorists look for ‘soft’ targets. These types of places may include parks, convention centers, museums, hotels, clubs, outdoor markets, etc. Bottom line, attackers are looking for places where they can inflict a great deal of damage and terror relatively easily and quickly. Terrorists also look for places where a lot of people gather. Finally they look for places where their defenses are down and a security presence is non-existent. Take some time to list what your main concerns are. Are you trying to prevent access to certain people? Worried about possible attacks against people on your property? Are you worried about the safety of guests, employees or patrons? Is there violent crimes or armed robbery a problem in the area? If you answered ‘yes’ to any of these questions, you may want to consider the use of an armed security guard. An armed security guard is an intimidating force that can help create a more proactive security measure. That being said, there are cons to having an armed security guard. Armed Security guards have the authority to use deadly force if the need arises. Because they are carrying a weapon and the authority that it represents, you have to consider the message that sends to people working, living or visiting your property. Also, know that if an incident does occur, liability can fall back on you as the manager/owner of the property. The other option for your property is an unarmed security guard. An unarmed security guard is more useful in situations where you are looking to prevent issues such as trespassing, vandalism/graffiti, and transients. 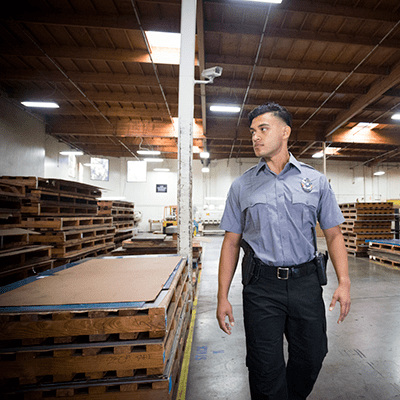 Unarmed security officers can be less threatening to visitors and become more of an ambassador for your brand/company while still offering a proactive security solution. An unarmed security guard can still provide a similar level of deterrence as an armed guard, though it would provide less of an “intimidation” factor. Lastly, identify a budget for your security. What are you able and willing to spend? Armed guards cost more money than unarmed guards. This is due to the insurance, licensing and training requirements. Also, many armed guards have a background in military or law enforcement. The experience and liability that armed security guards possess is the reason that the cost is higher. By answering these questions you now have an educated thought as to what type of security guard you want for your property. Now, here are questions to ask a security services company to ensure that they can provide you with the type of security you need. Can or will the security company provide both armed and unarmed security guards? Are they insured for both armed and unarmed guards? What training do they provide their guards? What is their professional opinion as to what type of guard should be used for your property? First of all, there are many companies that do not provide armed guards due to the liability and insurance costs involved. If you think that your property needs an armed guard, make sure the company you are interviewing provides armed guards. Don’t be pushed into a decision that under-secures your facility. As for insurance, ensure they have General Liability and Workers Compensation Insurance- at least $1,000,000 in both. In California, the minimum General Liability insurance that a security company must be insured for is $1,000,000. The last thing you want is an undertrained or completely untrained security guard that has a gun in his/her hand on YOUR property. When you are contracting a security company for an armed guard, you are placing a large amount of trust in them. There is a lot of liability that can fall back on you if that guard misuses their weapon or authority. For more information on training and identifying whether or not a security company trains their security guards, please see Untrained Guards A Problem For Security Companies. Lastly, find out what the security company’s professional opinion is. They should have advice that will help mitigate risk for your property while helping you stay within your security services budget. Whether choosing an armed security guard or an unarmed security guard, a strong security presence can reduce risk, increases safety, and provide much needed protection for employees, residents, and assets. Setting a new standard in private security servicesPPO # 18012 | Serving Simi Valley, Thousand Oaks, Newbury Park, Westlake Village, Agoura Hills and nearby areas.